Could there be a more classic summer dessert than a strawberry shortcake? Probably not. So when I finally got my hands on a lug of gorgeously fragrant, deep red strawberries from a local farm, all I could think of was making this simple dessert to showcase these berries. Last are the strawberries. This dish is best with fresh sweet summer berries. Pick ones that are small and red to the core, preferably from your local farmers market and not shipped to the supermarket in plastic boxes. There is a huge difference. Depending on the size of the strawberries, halve or quarter them and dust with a bit of sugar. As the strawberries sit they will gently weep and make a beautiful pink syrup. Scoop the berries and their syrup onto the pillow of whipped cream and top with the other half of the biscuit. Simple and delightful. The last time we made these was the 4th of July, so we tossed in some blueberries as well to go with the red, white, and blue theme. My son insisted that the dessert would benefit from the option of Chocolate Pudding as well. He was right. We went with the self serve model, allowing each person to create their own shortcake dessert from bowls of whipped cream, strawberries, blueberries, and chocolate pudding. For a more formal approach, serve the assembled shortcakes. Preheat oven to 425 degrees. Line a baking sheet with parchment paper or baking mat. Sift together dry ingredients (flour, sugar, baking powder, and salt) in a large bowl. Work the butter into the dough until pieces are the size of large peas. You may use your hands, a pastry cutter, or pulse using a food processor. Pour buttermilk into flour mixture. Use a spoon to mix until a dough ball forms. Turn dough out onto a board and gently knead one or two times to fully incorporate the ingredients. Flatten dough into a 1 inch tall slab, then fold it in thirds as you would a letter. This will create nice layers in the dough. Flatten once more into a 1 inch thick slab and cut to your desired shape. I used a 3-inch biscuit cutter, but really you could make these any shape you please. Place biscuits on prepared baking sheet. Brush tops with reserved buttermilk and sprinkle with reserved sugar. Bake for 16-20 minutes, depending on the size. 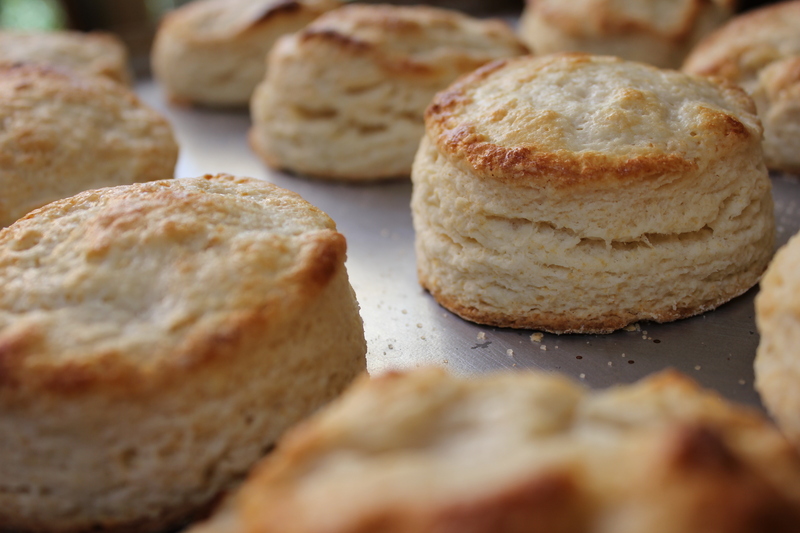 Pull from the oven when biscuits are lightly golden brown. Transfer to a wire rack and cool. Meanwhile, wash, stem and slice the strawberries. Put strawberries in a bowl and sprinkle 2 tablespoons of sugar over the top. Cover and let sit at room temperature for an hour or so. Whip the cream with the remaining 2 tablespoons of sugar until it holds its shape, but is still soft. When you are ready to serve, split the biscuits, drop a generous dollop of whipped cream on the lower portion. 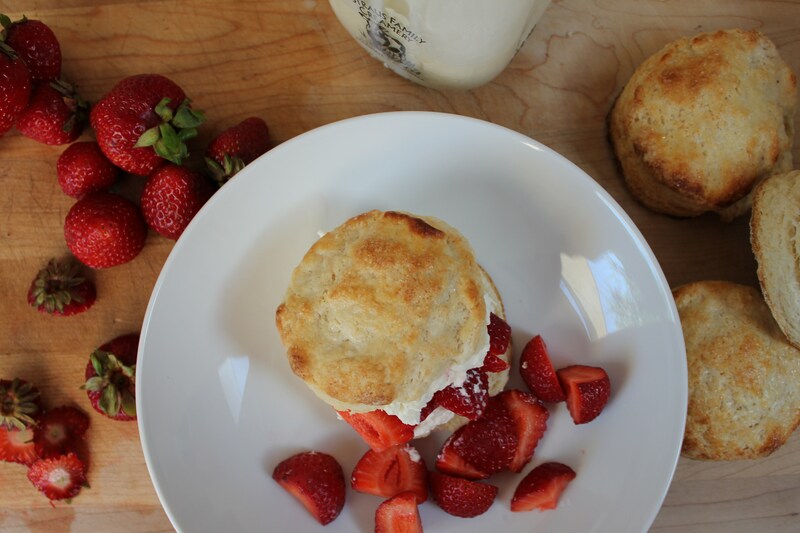 Lay the saucy strawberries over the cream and top with the top of the biscuit. Serve immediately. I am now adding Strawberry Shortcake to this weeks meal plan. Thanks for the great idea. You are welcome, Donna. They really are a treat! It just doesn’t get any better than strawberry shortcakes! These are just lovely. I need to make some too! Stunning, Karen! 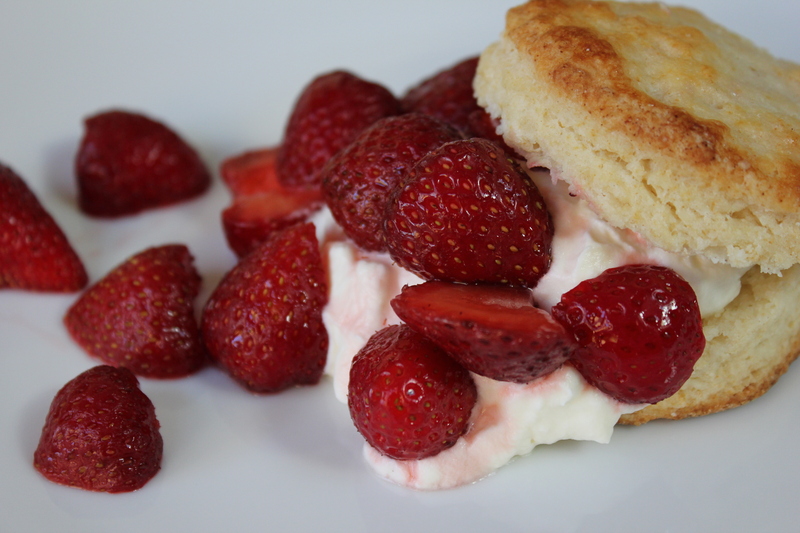 Strawberry Shortcake is my favorite summer dessert and I haven’t made it yet. I usually make a cream scone, so I’ll have to try a buttermilk biscuit. Yours look so flaky and delicious!